About Air Filter Cleaner Kits: You spent all that money upgrading your air intake system, now you need to keep it working optimally. A filter oil and filter cleaning kit comes with both a cleaning solution to clean your filter, as well as the oil you will need to recharge your filter and keep it working like new. You should clean your oiled filter with an Air Filter Cleaning Kit every 12000 miles, or annually. If you drive in dusty or dirty conditions, you should clean the air filter more often. Most Air Filter Cleaning kits should be sufficient for three cleanings before running out. Remember, a dirty filter will cost you a lot more in lost power and fuel economy than the cost of an Air Filter cleaning kit! So whats stopping you? 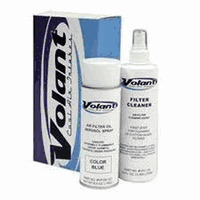 Click on an Air Filter Cleaning Kit below and start shopping.